Last year, the Rowan men’s soccer team put together one of their best seasons in recent history. It made an appearance in the 2015 NCAA Division III Championship Tournament, but was ousted 2-1 by Dickinson College in the first round. There does not seem to be a hangover with this year’s team however, as the Profs are off to their first 3-0 start since 2010. Two of those three wins have come against SUNY Oneonta and Lycoming College, who were ranked third and 10th, respectively in the DIII preseason rankings. The season opener win at Lycoming came on Sept. 1, the first day of classes on campus. While students were looking over syllabi, the brown and gold were scoring goals. Sophomore defender Will Sjaastad netted the first of the season off a penalty kick. Junior midfielder Tyler Logar and senior forward Vinny Ignatowicz added to the total in the 3-2 victory. 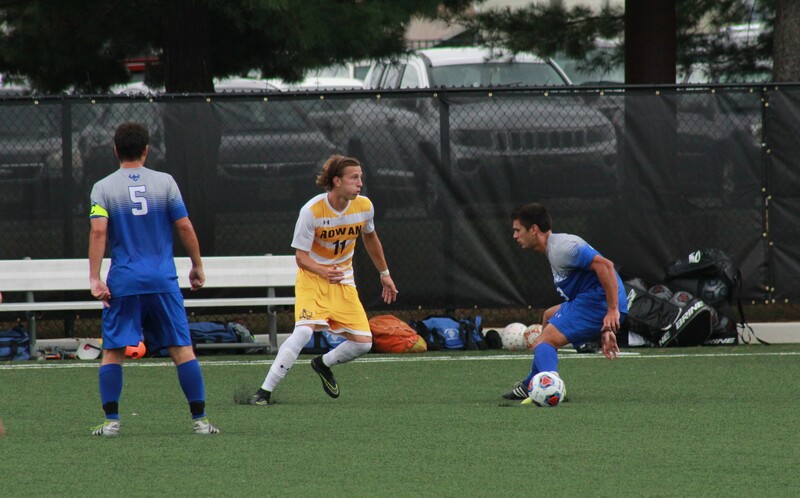 Sjaastad, Logar and Ignatowicz are the captains of the 2016 men’s soccer team, and head coach Scott Baker said that without their leadership, the Profs would not have won the game. Following the Lycoming win, Rowan returned home to Glassboro to take part in the Gilmore Alumni Classic against Washington and Lee University and SUNY Oneonta. The Profs rode a strong second half to a 2-0 victory against Washington and Lee on Sept. 3, with goals by Ward and sophomore forward Shane Doherty. Sophomore goalkeeper Kyle Dennis registered his first shutout of the season. That mentality proved victorious as the brown and gold were able to upset SUNY Oneonta 1-0 off a late goal by Sjaastad. The result is more impressive since the Profs played with 10 men following a red card late in the first half. For Baker, it is his first win against a top-three team and his third against a team ranked in the top 25. However, it was not different than any other victory. Baker added that the team needs to get better and that despite the win, the team did not play their best. Rowan’s next game comes against The College of Staten Island in Staten Island, New York, on Friday. The Profs defeated the Dolphins last year at home, 4-0.